Traditional material for walls buildings in Russia is tree. We love timbered, regularized round, frame and even board houses for their comfort, beauty, heat and especial natur. "Wooden" architecture is close to surrounding nature, is perceived as its integral part. Wood and production from it in a world practice are one of basic kinds of building materials owing to high adaptability to manufacture, ecological compatibility, a thermal capacity and a noise isolation. Buildings from wood materials at correct calculation of section of constructive elements and their connections Stability to earthquake, are capable to resist long time to influence of fire and explosive loadings. wooden house easy so at its construction it is possible to save on materials for base. Construction of such house does not assume use of elevating mechanisms which work costs certain money. Besides wooden house — growing, to it always it is possible to attach necessary quantity of rooms, wings. Wooden housing construction in natural expression grows in Leningrad region annually on 35 % (as a whole across Russia growth makes 40 %, data of Goskomstat). Growth of demand for complete sets of wooden houses speaks both popularization of harmless habitation, and their rather low cost: from 15 up to 30 thousand roubles for m2. Meter depending on technology. The tree becomes more and more popular also owing to distribution of new ways wood manufacturer. By means of new technologies modern wooden houses become more and more durable, and also rather easily erected. Application of special glues for connection of wooden elements allows to create constructive elements of any length and form that enables for an embodiment various architectural. And improvement of quality of wood by pressing, processings structures do a tree by material even more fire-resistant and not subject to biological destruction. One more unconditional plus of wooden construction, in opinion of general director of Association of wooden housing construction. As in it there are no "wet" processes as, for example, in case of with concrete, contractor is deprived an opportunity of unreasonable overestimate of quantity of spent materials. To write off them "on left" it is simply impossible: wall of wooden house can be disassembled and looked always, how many cunningly material. Wooden houses are popular all over world both as time country habitation, and for constant residing. For example, in USA annually buy 500 000 wooden houses, in Japan — 300 000, in Europe — 100 000. In Scandinavian countries of 90 % of all houses — wooden, most various design, and in one only Finland 4000 cottages for constant habitation and not less than 5000 country houses annually are under construction. And in many European countries at support of governments programs on stimulation of growth of wooden housing construction are successfully realized. As a result in Finland for last 10 years share of houses from a tree has reached 70 %, in USA — 80 %. We shall tell, by way, that thus wooden houses in same America — dear pleasure, afford them rich enough people can. Such attention to branch in countries giving a close attention of own ecology, not casually. Tree — a unique renewed resource besides for manufacture of houses from this material it is not required greater power inputs. As to Russia, in its territory it is concentrated more than third of world reserves of a wood which great bulk most suitable for construction make coniferous breeds. However more than two thirds of saw-timbers Russia exports because of best cost offered abroad. On one hand, it positively characterizes competitiveness of domestic saw-timbers, with another — specifies backwardness of industry on processing saw-timbers. For sake of justice it is necessary to note, that state tries to adjust a turn of wood resources. If it was originally supposed to increase customs duties by exported raw wood up to 30 % by 2010 now speech already goes about 80 % per 2009 (not less than 50 euros for 1 ì?3;) . Plans on development wood manufacturer branches, to reduction of illegal cutting down and contraband of a wood are simultaneously developed. All these measures should constrain export from country of raw material and direct domestic industry for processing of own wood resources. Idea of development of wooden housing construction in country support " on top ". As expansion of application of a tree in construction was repeatedly declared in country leaders, wide use of products of deep processing of wood can become one of ways of realization of project " Accessible and comfortable habitation ". And, if in plans housing constructions some time idea of creation of large factories which could provide building of whole residential areas back prevailed, it became now clear, that alongside with large in regions averages and even fine enterprises for erection of small settlements — as country, and for constant residing are necessary. It is supposed, that development of industrial wooden housing construction and expansion of scopes of wood in construction will allow not only to solve housing problem in country with minimal expenses, but also will give a powerful impulse to development of a timber industry complex as for construction basic kinds of production from wood are necessary all: saw-timbers, plywood, wood plates, ñòîëÿðíî-building ïîãîíàæ, window and door blocks. While national project is "lifted" by those average and fine enterprises on construction of wooden houses. Most part from them works in market for 15 - 20 years. Here there were stable collectives and even dynasties while at greater, hi-tech enterprises essential deficiency of staff is felt. In small organizations know manufacturing techniques of wooden house (and also baths, change houses and so forth) "completely", adhering to traditions of Russian wooden architecture (as is known, in Leningrad region there are well kept samples of such architecture, XV - XVI centuries), but thus constantly trace occurrence of every possible novelties for wood manufacturer. In modern Russian market it is possible to allocate two cores of type of wooden houses: from massive wood (regularized round, balks at home, house from regularized round logs and glued round a bar) and wood-frame (including, panelboard). Constructive basis regularized round at home is timbered houses, consisting of logs horizontally laid against each other — "wreaths". important feature of this design is that at natural shrinkage houses and subsequent a deposit cracks between wreaths disappeared, wall became more dense and monolithic. That wreaths well adjoined to each other, in each of next logs on bottom party longitudinal groove got out. given reception was kept up to now. Houses from regularized round are closest than a log on appearance to classical Russian samples of housing construction — to Russian wooden towers. regularized round log is log transformed into cylinder by means of processing on special machine tools, that is identical diameter on all length. More often at construction of houses from regularized round logs use wood of natural humidity, ò. å. wood which has been not last chamber drying. It is connected by that process of chamber drying of logs is very combined, log should dry in regular intervals on all depth, differently there are cracks. That house from regularized round logs was warm, after Shrinkage and its full drying it is necessary. Such houses do not sheathe inside and outside, its polishing after full drying and painting is desirable only. Houses from a bar (with rectangular section easier) have logs more equal walls, them to build to finish easier. Houses build of a bar of natural humidity of usual rectangular section, as a rule, counting upon subsequent covering a siding, , a facing a brick. It is cheapest variant of construction from massive wood, but it is far not most bad on quality. First, at construction of house from a bar of its rectangular section it is easy to warm outside, having arranged a heater between a wall from a bar and external furnish. Secondly, at competent warming house outside (on technology of a ventilated facade) bar-shaped walls appear in much more comfortable òåìïåðàòóðíî-âëàæíîñòíûõ conditions, that much more increases service life of house. Thirdly, external covering of house which are taking up all destroying influence of a sunlight and atmospheric precipitation, easily gives in to replacement. At construction of house from regularized round a bar of natural humidity it is not possible to reach same accuracy of interface of bars, as for houses from glued round a bar as after manufacturing its details, during their transportation and assembly of house, bar continues to dry and, hence, to be deformed. Besides during drying a tree on obverse surfaces of a bar there can be cracks. These lacks of houses from a bar of natural humidity are compensated by: cost regularized round a bar of natural humidity is less than cost glued round a bar more than twice. Houses from glued round a bar have allowed if not completely to solve considerably to lower an acuteness of two basic problems of wooden housing construction: Shrinkage. Construction of houses from glued round a bar differs high accuracy and adaptability to manufacture of process. All corners at such construction equal, walls — smooth, without cracks, with an amber wood structure. 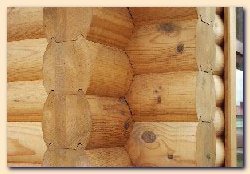 To make êëååíûé a bar, boards from wood of coniferous breeds carefully dry up to humidity of 8-10 % (what very difficultly to make with a log or an integral bar), from them cut out defects — cracks, dropping out knots, a core and ò. Item — and glued them on length on a mini-thorn. Preparations — boards, well dried, identical on length and homogeneous on structure as a result turn out. Prepared boards move out and stick together under pressure special with glue in rectangular preparation which then regularized round and moves out up to first class of cleanliness. Before pasting boards once again sort, that annual rings next boards settled down in different directions. So it is possible to compensate pressure arising at change of atmospheric conditions, and to guarantee, that bar will not warp. Assembly of house from glued round a bar on a building site occurs quickly and precisely, practically without additional adjustment. Figuratively speaking, complete set of house from glued round a bar gathers, as children's designer. Basis of wooden panel house of factory manufacturing panels (fine, width, as a rule, make 1,2 m or large, size " from a wall up to a wall ") on wooden skeleton sheathed from two parties corresponding wooden by materials. For this reason such houses often classify as wooden houses of a wood - panel design. In Russia panel houses are made on domestic, Finnish, German, Austrian and American technologies (basically on an accessory of basic process equipment to country-manufacturer). As an external covering of panels of such houses are applied more often: âàãîíêà, a plastic or aluminium siding, it is cement-ñòðóæå÷íûå plates. As a variant of external facing last years application brick facing from front party more and more finds. Some factories of panel wooden housing construction apply as an external covering of panels of plate OSB. Long-term domestic experience of manufacture of frame houses testifies about enough high efficiency of their factory manufacturing: cost 1 ì2; total area of such house has less on 30 - 40 % of cost of 1 m 2 than panel house. Draft of Russians to a country way of life does not weaken, to live on ground begins fashionable and prestigious. As if to new directions of a fashion in construction, they come and leave, and classical always remain. house — not a thing which it is necessary to change everyone some years. And to townspeople tired of a civilization understanding comes, that sound wooden house will serve not only to it, but to children and grandsons. Builders observe obvious interest of petersburgers to wooden houses which are considered as country habitation for constant residing. Muscovites (according to company " NIRGOS ", exclusive distributor of concern NIRGOS in Russia), by virtue of developed habits and stereotypes, from a tree prefer to build that house in which have a rest on days off or during holiday. If it is a question of houses for constant residing while in Moskovsk region brick houses use greater popularity. According to " NIRGOS ", share of stone houses and houses from a brick makes of 33 % in Leningrad region. share of wooden houses of 29 %, and even more often occurs overlapping several kinds of materials at construction of one type of a home ownership. So, for example, at creation of a cottage in style "chalet" stone and a tree are used; frame designs for strengthening temperature constancy, durability and resistibility to atmospheric influences can get off as beton, and a brick. stone, a brick and a tree are applied to construction of more dear habitation while wood - panel technologies (16 %) become demanded in an economy class, ò. To. It allows to reduce essentially cost for m2. M of ready house. In opinion of experts of company NIRGOS, future in construction — behind a combination of various materials where in combinations glass-tree, concrete-tree, plastic-tree will be possible to unite advantages of various materials. As a whole it also will lead to active use of wooden materials. On Dmitry Nepomshina's belief, general director of company " NIRGOS ", not only combination of various materials, but also their modular manufacturing at a factory in ready designs will give dynamics to construction and will allow to improve considerably quality of construction as factory manufacturing protects building materials from a bad weather, and automation allows to avoid mistakes and failures as ready designs. Under one forecasts, by 2010 volume of construction from a tree in Russia can reach 10 million in m 2, by estimations of others — and at all 24 million in m 2 (now this parameter exceeds 6 million). In Leningrad region approximately 175 thousand square meters of wooden habitation, this third place among all subjects of federation annually is under construction. Under assumptions of experts of Association of wooden housing construction, nearest years from a tree will be under construction from 50 % up to 80 % . This assumption and recently opened exhibitions ready wood at home " Cottages in Ozerkach partly prove. On first of them in 12 from 15 exhibition cottages in this or that kind tree, whether it be a log, a bar, panel or a wooden skeleton is applied. second exhibitions-fairs working in a mode, represents basically wooden constructions.